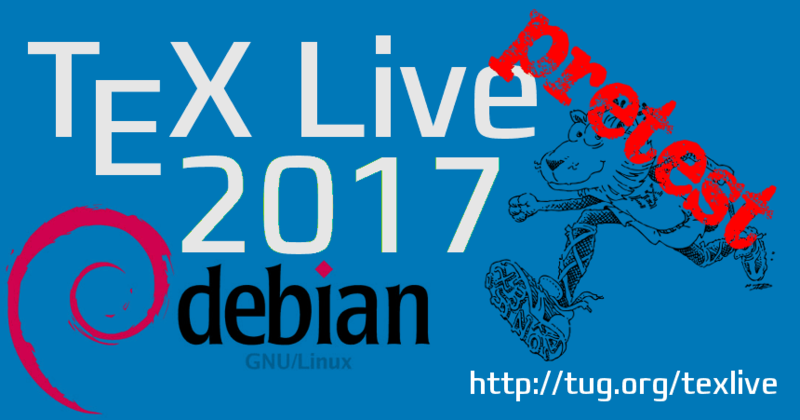 TeX Live 2017 is expected to be released next week, and the Debian packages for it are already uploaded to the Debian servers. Time to prepare for release parties and stack up prosecco! I have uploaded all the packages matching with the planned release of TeX Live 2017 to Debian/experimental, and most of them should be already available there. texlive-extra has to go through NEW processing, though. Other changes can be found in the svn repository. The packages are signed with my usual Debian GPG key. Enjoy, and let me know if there are any problems! does that mean that tex4ht will not be included in Debian’s TL? or the packages from texlive-htmlxml will be moved somewhere else? Of course tex4ht is included, it is now in texlive-plain-generic. I just see that I need to add a dependency from the dummy tl-htmlxml to texlive-plain-generic, will be in the next upload. Where is it then? Wasn’t it supposed to be released today? TeX Live 2017 will be released over the weekend (baring desasters). What I was blogging about are the Debian packages of TeX Live 2017 that have entered Debian/experimental. I get that it might be harder for you to stay neutral on this issue, but is it really a good idea to use the Debian packages rather than using TeX live’s own package manager infrastructure. I get that this is the same old discussion as with Perl, Haskell, Firefox extensions and whatnot, but in the past I always ran into problems when using the Debian packages which I why I don’t even try to use them any more and I am doing everything using `tlmgr` right away. Also, I am apparently not the only one, as the majority of people at tex.SE seem to think the same way. I think the Debian packages are quite good and completely sufficient for more than 90% of the users – even for myself they are completely fine. I just write mathematical papers and don’t need the newest features. For the remaining 10 something percent, those playing with new developments etc, the Debian packages in *stable* are not good, but testing and sid are fine, because I update the packages about once a month. So it really bills down to what you need and use.